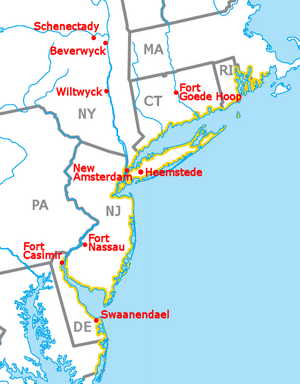 Map showing the area claimed by the Dutch in North-America and several Dutch settlements. New Netherland (Dutch: Nieuw-Nederland, Latin: Nova Belgica or Novum Belgium) was a colony of the Dutch Empire from 1614 through 1664 and from 1673 through 1674. It was a base for the fur trade. The capital was New Amsterdam, modern-day New York City. The other important trading post in New Netherland was Fort Orange, now called Albany, New York. Most settlers lived in these towns or between them, along the Hudson River but some lived in distant parts of the colony. During the Anglo-Dutch Wars England conquered New Netherland and divided it to make the English colonies of New York and New Jersey. The English also gave parts of it to Massachusetts, Rhode Island, Connecticut, Pennsylvania, Delaware and Maryland. Map of New Netherland and New England. North is to the right. The storehouse of the Dutch West India Company in Amsterdam, built in 1642, became the headquarters of the board in 1647 because of financial difficulties after the loss of Dutch Brazil. The original settlement has grown into the largest metropolis in the United States. "Main Street" for the province, the Noort Rivier, was one of the three main rivers in New Netherland. In maritime usage, North River is still the name for that part of the Hudson between Hudson County and Manhattan. New Netherland Facts for Kids. Kiddle Encyclopedia.